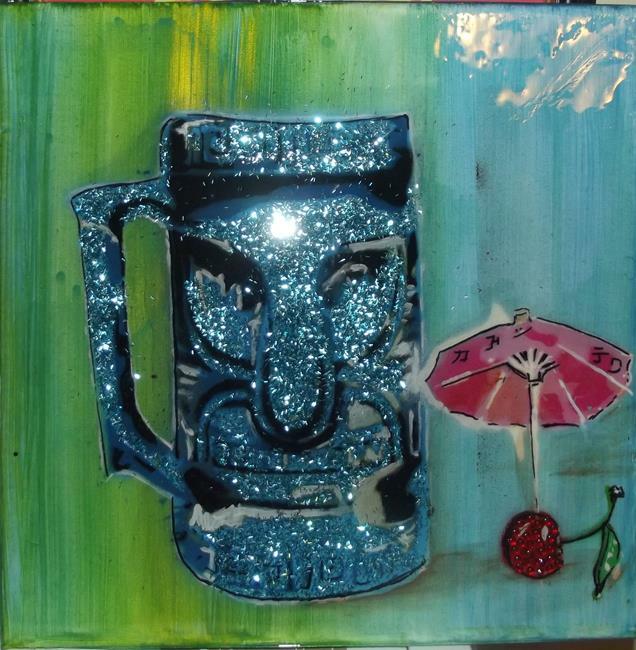 Tiki Cups "Glitter" Original Graffiti Spray Paint Pop Art 12" x 12"
Tiki Cups "Glitter" 12" x 12", fun retro inspired from my personal collection of Mid Century Tiki Cups. . Original Graffiti Pop Art. Get ready for a fun and fabulous pop of color on your wall, by EBSQ Artist of the month Paul Lake and member of the Maryland State Arts Council. You may have seen my work in different galleries from Maine to North Carolina or in VA's Torpedo Art Factory & Artomatic. Each original graffiti painting starts off by drawing a clear transparent film and then hand cut with an excato blade that takes around 20 hours, then added to an exciting, bright background with spray paint and detailed with small brush and acrylic to make a fun, and exciting, original piece of art. This original piece of art is mufti media using acrylic and spray paint, glitter and rhinestones with a thick coat of Resin over to give a very "Glass" look. Unlike some mass produced cheap imports that don't come with the stretchers and cost $40 more, my art is ready to hang and one of a kind. The painting is signed on the back and comes with a COA (certificate of authenticity).